Home owners who want to sell FSBO in Westchester NY have more options today than simply putting a For Sale By Owner sign on their front yard. We’ll teach you in this article how to sell For Sale By Owner in Westchester NY and how to list your home on the Westchester NY MLS without having to pay 6% in commissions. Why Is Selling for Sale by Owner in Westchester NY so Difficult? 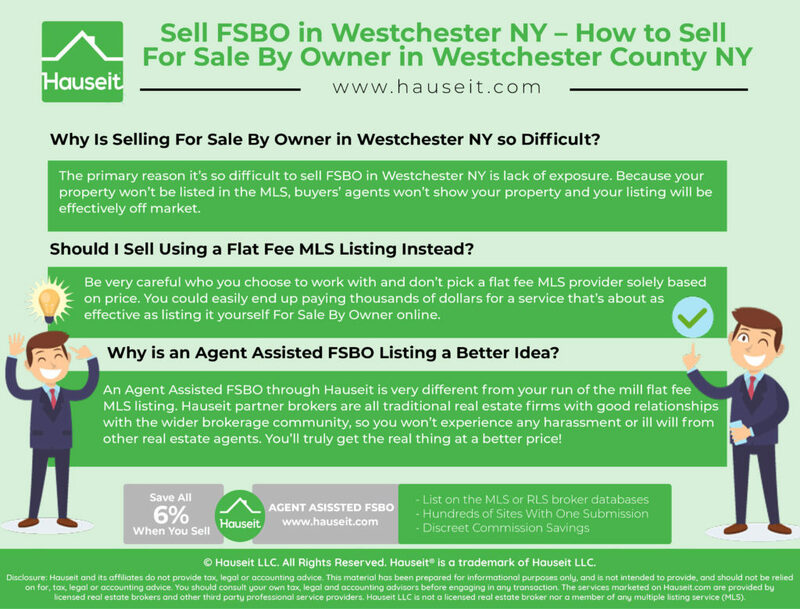 Should I Sell FSBO in Westchester NY Through a Flat Fee MLS Listing? Should I Sell FSBO in Westchester NY Through an Agent Assisted FSBO? 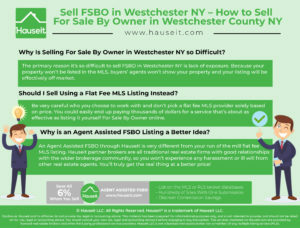 The primary reason it’s so difficult to sell FSBO in Westchester NY is lack of exposure. Historically, For Sale By Owner in Westchester NY meant sticking a For Sale sign in your front yard and maybe even buying some classified ads in the local newspaper. This unfortunately resulted in incomplete exposure as the only buyers who would know about the FSBO property would be those who happened to drive by and see the sign or those who happened to glance at the classified section of the local newspaper. Before the advent of the internet, this meant the FSBO seller would miss almost 100% of all buyers because buyers all searched with the assistance of a local real estate agent. Real estate agents would never see the FSBO listing because they searched for available listings in their local Multiple Listings Service, which back in the day consisted of voluminous books of listings aggregated from all participating brokerages. The same issue for FSBO sellers persists today even with the prevalence of the internet and the many popular consumer facing real estate search websites in existence. Unfortunately, selling a Westchester NY home FSBO is not as simple as just listing it For Sale By Owner on a popular real estate search website and watching buyers and offers roll in. You’ll still miss the roughly three quarters of all buyers who search with a real estate buyer’s agent because your listing is not in the local MLS. Furthermore, even if an agent representing a buyer did find your For Sale By Owner listing, why on earth would he or she dare show it to their client? Each buyer is worth up to 3% in commission, so there’s no way a Realtor would risk that payday by sending them a FSBO listing where they could easily be looped out. Roughly 97.5%* of all listings in Westchester County, NY are listed by an agent. That means the vast majority of listings are inputted into the Westchester County MLS with commissions that are contractually offered to buyers’ agents. A buyer’s agent has no risk in showing a MLS listing to their client because they know they will automatically be paid if a deal closes! Furthermore, the fact that your listing is advertised as a For Sale By Owner property makes you the target of incessant harassment and solicitation from real estate agents hoping to poach your listing. The harassment will get so bad and so frequent that you’ll have serious trouble filtering real inquiries from fake ones. That’s because real estate agents will often pretend to be direct buyers to get in contact with you, or they’ll claim to have a buyer only to show up empty handed to pitch you their listing services in your living room. In summary, missing out on the majority of home buyers makes FSBO properties essentially off market. Furthermore, the harassment that FSBO sellers experience discourages most from continuing to try to sell their home themselves after only a few weeks at most. *Based on a Hauseit study conducted on 11/3/2017; there were 4,481 total For Sale listings in Westchester, NY of which only 110 were listed as For Sale By Owner according to a popular, national real estate search website. Flat fee MLS listings have the potential of significantly boosting your listing’s exposure; however, be careful of most flat fee MLS companies which are little more than mom and pop operations or bucket shops. You should also be careful of larger flat fee MLS servicers who claim to cover all 50 states. Most of these operators subsist on volume and therefore do not care about the efficacy of their service or the outcome of your home sale. As a result, they often have nauseating company names that are extremely offensive to traditional brokers who represent most home buyers. Think names like “agents can die” or “no agents please.” You get the idea. Shockingly, almost all flat fee listing brokers both large and small use egregiously offensive brand names such as these. It’s no wonder that traditional real estate agents get offended and end up boycotting these listings just like they ignore For Sale By Owner listings. In summary, be very careful who you choose to work with and don’t pick a flat fee MLS provider solely based on price. You could easily end up paying thousands of dollars for a service that’s about as effective as listing it yourself For Sale By Owner online! 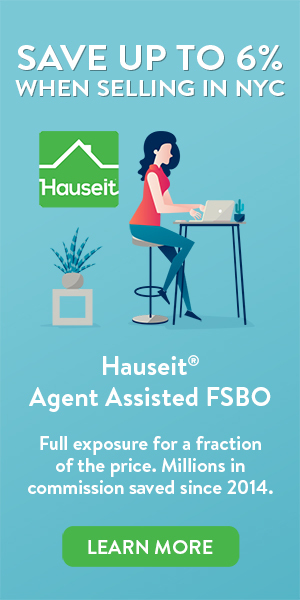 An Agent Assisted FSBO through Hauseit is very different from your run of the mill flat fee MLS listing. Hauseit only works with brand name, traditional real estate brokerages in New York who have discreetly agreed to provide private label discounts to our customers. You’ll be paired with an independent, brand name brokerage who will list your home on the HGMLS, otherwise known as the Hudson Gateway Multiple Listing Service which covers Westchester County. Your listing will be mixed in with our partner broker’s traditional listings, and other brokers won’t be able to tell that you’re only paying a flat fee to the listing broker! As a result, you’ll receive the same, full marketing exposure as another customer who is paying full commission. Your home will be listed on the MLS and syndicated to dozens of popular real estate search websites as well. Once you receive an inquiry, whether it be from a broker representing a buyer or a direct buyer, it’s simply up to you to take it from there. Most importantly, because our partner brokers are all traditional real estate firms with good relationships with the wider brokerage community, you won’t experience any harassment or ill will from other real estate agents! You’ll truly get the real thing at a better price!